Did I tell you I bought 5 lbs. of frozen blueberries at Costco a few weeks ago? I follow America's Test Kitchen on Twitter and they tweeted a recipe for an amazing looking blueberry bundt cake. Mouthwatering pictures get me every time. I immediately knew I had to make it over the weekend. I headed to Costo to get some fresh blueberries, but they were EXPENSIVE. No way was I going to spend that much. So, the next best thing . . . frozen berries came to mind. They had a giant 5 Lb. bag for $8 or $9 bucks. Way better deal at the time. I got home and bad news . . . it was going to be a stormy weekend. There was no point in making a beautiful cake and not being able to photograph it, because it is gloomy outside. By the time the weather was nice, I had already moved onto a different treat. 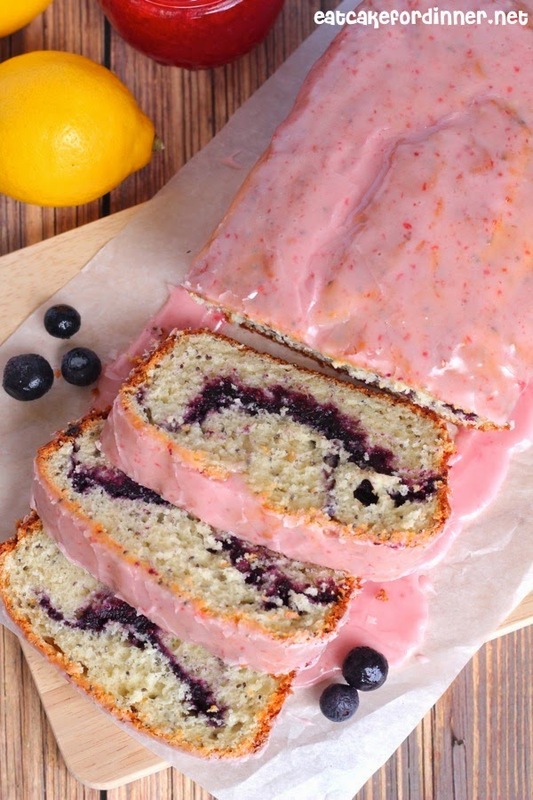 This delicious Blueberry Swirled Bread. I used the same recipe from my Strawberry Swirled Lemon Poppy Seed Bread and used blueberry jam instead of strawberry and topped it with a delicious strawberry jam glaze instead of a lemon glaze. Of course, it turned out delicious! If you want your icing to get nice and crisp like on a donut, add meringue powder. My favorite little trick to the perfect icing. 1 tsp. imitation lemon extract (or zest of 1 lemon), opt. Preheat oven to 350 degrees. In a medium bowl, cream together the butter and sugar. Add the egg, egg white, vanilla and lemon extract and mix until well blended. In a separate bowl, combine the flour, baking powder, baking soda and salt. Add dry ingredients and Greek yogurt alternately to the batter, starting and ending with dry and mix until just combined. Spread half of the batter into a 9x5-inch loaf pan. Top with blueberry jam, leaving a small border around the edge. Do no swirl the jam. Top with remaining batter and carefully spread out evenly. Bake for 45-50 minutes or until a toothpick inserted in the center comes out clean. Cool in pan 10 minutes, then invert to a wire rack and cool completely. Meanwhile, make the glaze. For the Strawberry Glaze: Combine all ingredients and mix until smooth and creamy, adding milk only if needed to reach a glaze consistency. Pour over cooled bread and allow to harden. If you are in a hurry, you can pour this over the warm bread. Blueberries and strawberries together in a bread, this is the greatest idea, LOVE it!!! If I had it here now, I would go to bed full of happiness. And then wake up, and have a little more to start my day. 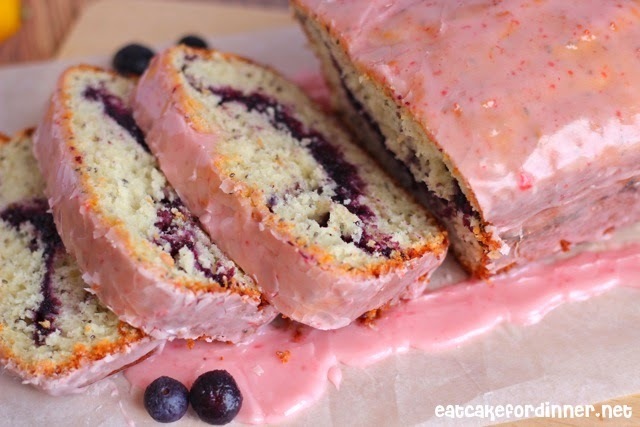 What a great bread.. blueberry filling and strawberry glaze.. looks fantastic! I have some strawberry jam that might have this calling out to it soon. I have never put it in bread and icing before but it looks amazing!! I am a little excited to try it. I love using jam in quick breads and now in glaze too! Let me know if you try it.